Scrum advocates the use of fixed length sprints. The length of the sprint can be adapted to balance between the need to release rapidly and allowing enough time to complete a useful amount of work in each sprint. Once an appropriate length is found, it generally stays the same. While fixed length sprints are an improvement over waterfall style development in many respects, it imposes an artificial deadline for teams and this can cause inefficiencies and technical debt. Sprints may have fixed lengths but user stories, on the other hand, are not homogeneous at all. Stories differ wildly in complexity and the time required to complete them. Teams will estimate their size and then commit to completing a certain number in a sprint. Seems reasonable enough but…. 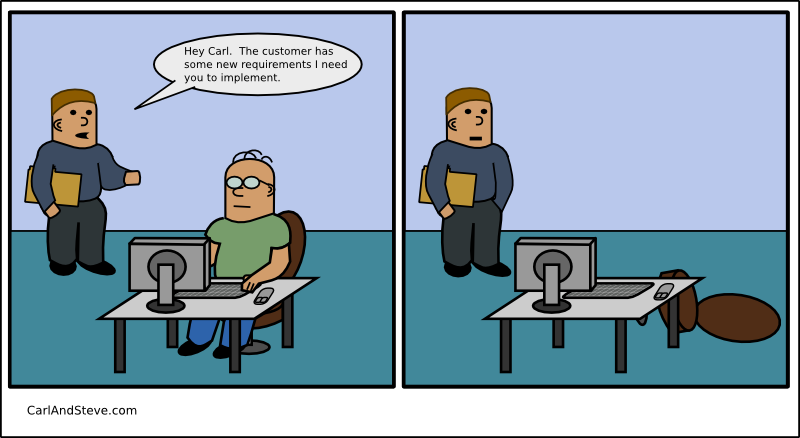 A scrum team will ALWAYS either over-estimate or under-estimate the amount of work that can be completed in a sprint. This leads to one of four possible scenarios occurring. If a team under-commits a lot, it is usually not serious as a new story can easily by in-scoped, which will lead to one of the other 3 scenarios being triggered. Some teams may in fact work more slowly in order to prevent a new user story being in-scoped, either consciously or unconsciously. This risk, however, probably only applies to highly unmotivated teams. Note: The problem described in this post was for DMD v2.054 and it no longer occurs with the more recent DMD v2.058 (see below for details or view the discussion at the D Forums). I am currently working on a Ruby project that uses a lot of regexes on large volumes of text. It is currently running too slowly, so I decided to try to optimise it by implementing the regex matching code in the D programming language. D has given me a lot of joy (compared to C or C++) by making things like string (with Unicode) handling a breeze without taking the performance hit of supposed “productivity” languages. I painstakingly reimplemented my Ruby functions in D expecting a huge performance boost (actually I expected an order of magnitude performance jump) but instead I was shocked to see that Ruby outperformed my D code by a significant margin. The Ruby implementation was finished after 80 seconds, whereas the D program required around 280 seconds using the exact same regexes and the exact same input. Why should you adopt Test Driven Development? The answer is actually more complex than many people think. Of course we all want to have fully tested code to ensure that the code operates as expected. We also want to ensure that any new features do not break existing functionality (regressions), but what other reasons are there?